Photos by Joseph Robertia, Redoubt Reporter. An angler carries a halibut, caught from shore near the mouth of the Kasilof River recently, while his friend continues to monitor his line from a camp chair. The from-shore fishery is becoming a popular way to try for halibut. Some parts of Galen Neptune’s Cook Inlet halibut fishing endeavor were much the same as anyone else’s. The Kasilof resident baited a herring on his hook, plunked it as deep into the water as he could and waited for the line to twitch. Within an hour it did. He snatched the rod, set the hook and began to reel, wondering the usual halibut-fishing thoughts of whether he’d find his sought-after flatfish on the other end, or something else hauled through the water. He continued reeling as fast as he could and was rewarded with his target species. “All right! It is a halibut, maybe an 18- to 20-pounder,” he exclaimed. But that’s where the similarities stop. For one thing, Neptune’s gear was not the typical, stout-and-relatively-short halibut rig, with plenty of line for plunking a line down into the water. His was a longer surf-casting rod, which he used to fling his heavy weight and attached line as far out to sea as possible. Even more striking was the difference in transportation to and from his fishing hole — no trailer, no boat launch and no boat required. Neptune walked the beach at the mouth of the Kasilof River, out to the water’s edge at low tide. Under a cloudless blue sky he hammered a pole holder rigged from a piece PVC pipe clamped to a length of rebar into the wet, black sand. 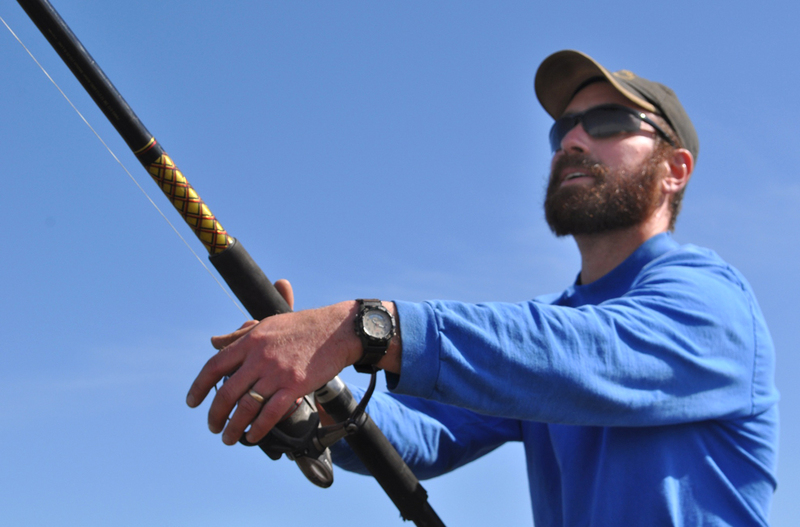 After baiting his hook, he pulled back his surf rod and let his line fly as far as he could into Cook Inlet, in the manner of about 20 other fishermen this recent spring day, attempting to catch a halibut from shore. It’s becoming a popular alternative to paying for a charter trip or launching one’s own boat to fill the freezer with white-meat filets. 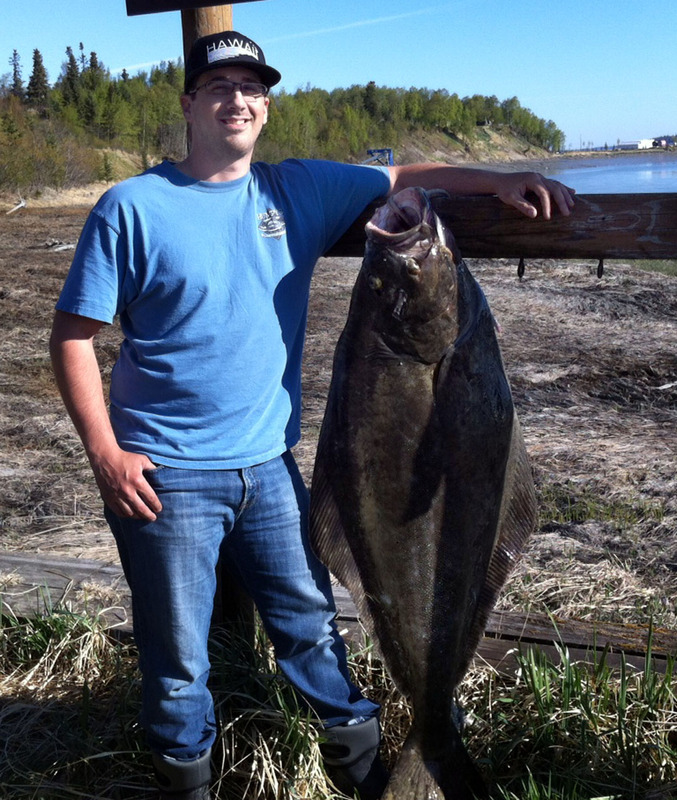 Galen Neptune, of Kasilof, pulled this 20-pound halibut from the water. This last statement is possibly a bit of prognostication, in the vein of longtime Alaskans harkening back to the uncrowded experience of sportfishing the Kenai River 20 years ago compared to recent times, with hundreds of sportfishing guide boats carrying thousands of clients throughout the summer months, and private anglers standing shoulder to shoulder in some places onshore. 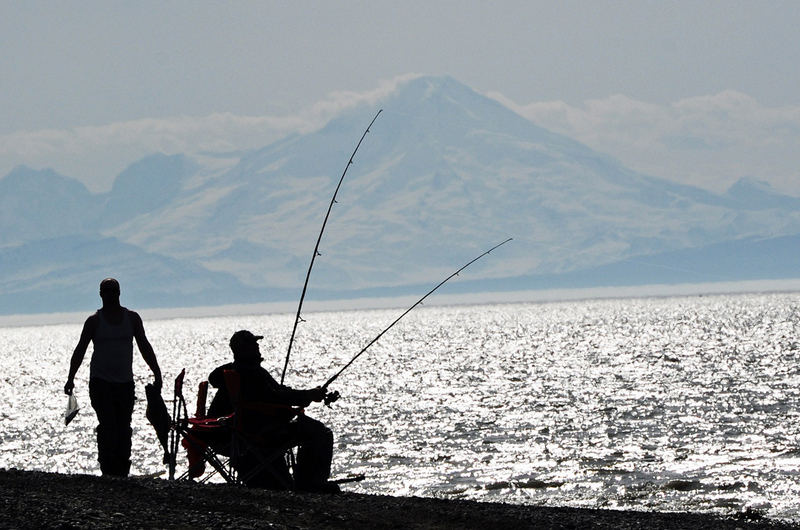 Will the peninsula’s beaches along Cook Inlet become that same way, packed with salt anglers seeking halibut like the Russian River is stacked with Kenai flippers seeking sockeye? Leon Mensch, of Kasilof, said he doubts a beach fishery will ever get too crowded, due primarily to the inconsistency of success in the shoreline halibut fishery. “I started three summers ago after I saw other people doing it and catching halibut, but it was a long time ’til I caught one. I fished for six days, at least two to four hours each time before I got one. And since then I’ve caught a lot more flounders and sharks than I have halibut,” he said. Mensch’s buddy, Joel Zebill, of Soldotna, added that the shoreline fishery wasn’t for those who need to have success at the end of the day. 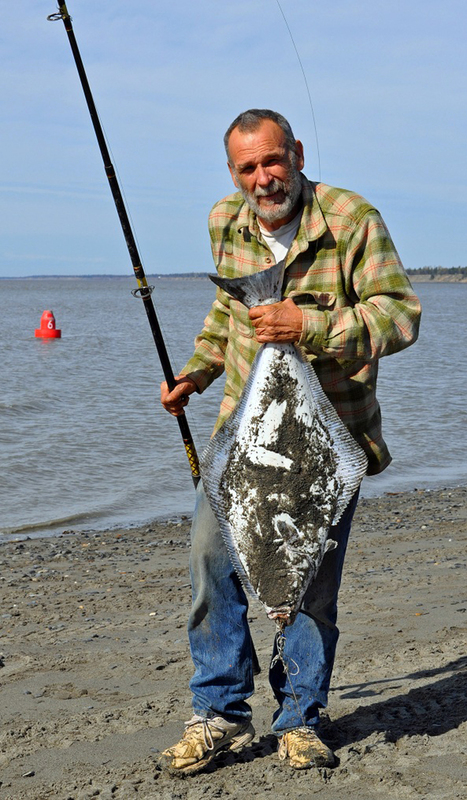 Leon Mensch, of Kasilof, casts into Cook Inlet in hope of catching a halibut. “I’m not a patient person, so this can be tough for me. This can sometimes be six hours of sitting, rather than fishing, so if I wanted to be sure of halibut I would still do a charter,” he said. Mensch said that the sizes of the fish aren’t the famed barn-door-sized halibut, either. “Most of what I’ve caught have been in the 10- to 15-pound range — good to eat, but small. I’ve been told other people have caught larger ones, though,” he said. Christopher Batin and Terry Rudnick, in their book, “How to Catch Trophy Halibut,” caution that while it is possible to catch halibut from shore, it likely won’t be big ones. They recommend fishing at the mouths of rivers and streams where dead and dying salmon wash out into the saltwater, particularly spots with a drop-off, ledge or similar habitat. The authors say they’ve caught chicken halibut on fly tackle while fishing for silvers from shore, nothing more than a few pounds. But that they’ve heard of much bigger results. “Tackle shops occasionally buzz with a tale of an angler actually hooking a huge flatfish from shore. One lucky angler managed to wrestle a ‘slab,’ 400-pound-plus halibut into the surf near Deep Creek; another hooked into a big halibut from the Homer Spit and was about to lose all his line to the rampaging fish when a boater picked up the angler, ran down, and subsequently landed the flatfish,” they write. Photo courtesy of Cameron Blakemore. Cameron Blakemore poses with the 100-pound halibut he reeled in from the shore at the mouth of the Kasilof River recently. Hearing of bigger fish can quickly translate into “knowing” bigger halibut can be caught from shore. Just a few folks down from Mensch, Jess Cooley, of Sterling, and Cameron Blakemore, of Anchorage, landed what was arguably the fish of the day — a 100-pounder. When held up by the 6-foot-1 Blakemore, the fish hung from shoulder height to the ground. The two men had dozed off while waiting for a bite, so when they finally got one it caught them off guard. Cooley grabbed Blakemore’s rod, the one that had caught the fish, and started shouting at his friend. “I woke up to the commotion and he was pulling it in on my rig,” Blakemore said. It took Cooley 30 minutes to get the fish to shore, and when they finally landed it they couldn’t believe its size, nor their beginner’s luck. “I’ve been watching people for a long time, but this was my first time fishing from shore,” he said. After they cleaned the fish they ended up with more than 40 pounds of fillets, which they decided to split equally due to the circumstances of how it was caught. “It’s nice to know we both have enough halibut for the year now,” Blakemore said.